ECA's Location Ratings are out and Singapore remains the most livable location for Asian expatriates, but how are the other Asian countries doing with regard to being attractive locations for Asian expatriates? Overall, the usual suspects remained the same as last year. 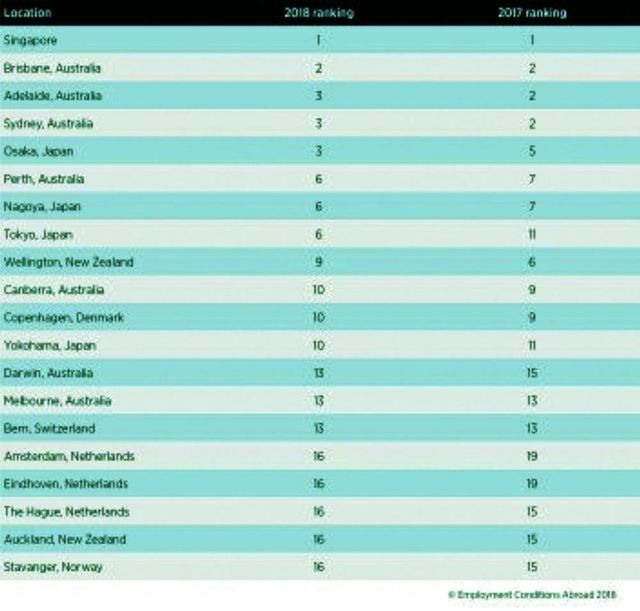 There were four countries (Singapore, Australia, Japan and New Zealand) that dominated the top 10 with Tokyo moving up five spots from 11th to sixth. All of the top 20 were located in Asia and Europe. None of the top locations were in the Americas region, the Middle East or Africa. There are a few areas of concern that impact a country's status of being the most livable location that many countries in APAC all agree on. Some common concerns are combating air quality and pollution. Other APAC countries are improving their housing prices, schooling quality and reducing crime rates in order to improve their status. Even though Singapore also has these concerns, they are able to stay on top of this list year after year. Another tactic to maintain their top-level status, the Singaporean government is helping out by investing significantly in their airport in hopes of becoming the world’s best airport. Taking into consideration everything mentioned above, what will companies that have a need for moving Asian talent into locations like Taipei, Beijing and even New York and London need to do to have assignees agree to go? Will companies need to adjust their relocation packages for moving their Asian employees into lower rates cities around the world? Singapore is once again the most livable city in the world for Asian expatriates. “Singapore has traditionally sat at the top of the ECA rankings and this year is no different,” said Lee Quane, regional director – Asia at ECA International. “This is due to a combination of factors such as low crime rates, easy access to good quality schools and healthcare and lower levels of pollution than a lot of other locations in the region.” Updated annually, ECA's Location Ratings system objectively evaluates a host of factors to form an assessment of the overall quality of living in over 480 locations worldwide. Factors assessed include climate; availability of health services; housing and utilities; isolation; access to a social network and leisure facilities; infrastructure; personal safety; political tensions; and air quality. Handraisers, perm transfers, cost - what does it all mean for mobility managers?